← Brain drain or bank run? Yesterday I wrote a post about the curiosity of seeing which blog posts are read more at different points in time. I pinpointed the case of a blog post related to taxes in France and Spain. I guessed that, referrals from the blog itself aside, this was due to the economic situation in Spain. Current Top Posts as of July 7th 2012. The Reconstruction of AF447 can be directly related to the recent publication of BEA final report on the accident. Airbus vs. Boeing, comparison of market forecasts (2011) must be related to the recent publication by Boeing of their 2012 Current Market Outlook. 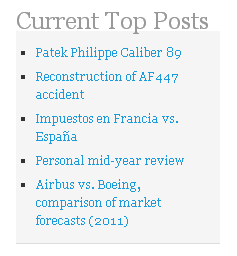 Now, could anyone tell me the reason for the Patek Philippe Caliber 89 being among those most read recently?